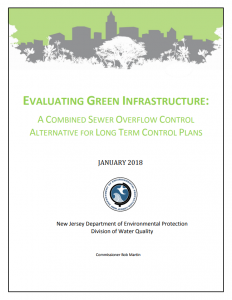 The intent of this document, Evaluating Green Infrastructure: A Combined Sewer Overflow Control Alternative for Long Term Control Plans, is to provide guidance to Combined Sewer Overflow (CSO) permittees within the State of New Jersey to evaluate green infrastructure (GI) as part of their Long Term Control Plans (LTCPs). LTCP implementation will be a long and expensive process. Many of the alternatives that will ultimately be implemented to address CSOs will be built on publicly owned land, the cost of which will be borne primarily by the rate payer. GI, however, can and should be implemented both on publicly and privately owned land, allowing the cost of GI to be shared by both the rate payers and private developers. a CSO permittee with including GI as part of its CSO Long Term Control Plan.